There are lots of articles that tell parents to have a dedicated study place for kids. Recent research is telling us that studying in the same place every time is not a good idea. It’s important that there be a place where all the books and supplies are located, but it is not so important that students use that area to study. In fact, most research is telling us that learning is better when homework is done in multiple locations. Some kids need to work around others, so having them isolated is a bad idea. Some kids like to do their math in one place and their social studies somewhere else. One of the most interesting ideas that has come out in recent years about learning is that some distractibility is actually a good thing. A bit of distraction puts the brain in better focus and, for most kids, will increase the ability to perform and remember better. This is why some kids do much better having some music on while they are studying. Again, research has supported the fact that having background music helps most kids stay focused. Background music does tend to get in the way of reading assignments, but for most other assignments it actually helps performance. Television and videos are still a complete no-no during studying. It is so distracting that the ability to focus decreases when screens are on. Another myth that has been debunked is that students should study at the same time each day. For most families these days this is an impossible task. The good news is that learning increases if studying happens at different times. So, don’t worry so much about the timing. Find what works for your child. Remember that willpower is like a fuel tank. It will become empty. We used to think that willpower was like a muscle: The more you exercised willpower, the more you would have. Actually, willpower is like a fuel tank: Once empty it’s very hard to get anything done. This explains why some kids can’t come right home from school and start their homework. Their tank is empty. You might be able to get them to sit in front of their books, but they will just sit there and whine. Never forget that your kids don’t need your help. They need your leadership. 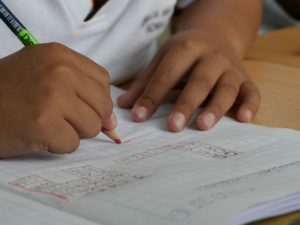 This is one of the most important ideas I focus on in my book: Homework – A Parent’s Guide To Helping Out Without Freaking Out! It seems counter-intuitive. “Of course my kids need my help,” you might be thinking. The problem is that the more we think our kids need our help, the more dependent they will become on us. The origins of the word “help” implies that I cannot do something on my own. Kids know this, which is why they often react negatively when we help them. Leading them, on the other hand, is something they need. When we are a leader, we are not doing it for them. Leadership is more about inspiring, reminding, and at times rewarding and punishing. I will share more ideas about leadership in a future column.